A long lasting and energy efficient LED floor lamp design that's up for any task. This hardworking LED floor lamp from OttLite seemingly does it all. Super bright LEDs produce a natural day quality light up to 700 lumens. The 12 1/2 inch LED array tops an adjustable column and rubberized gooseneck for a versatile light capable of providing a wide area of illumination. Touch-dimmer allows for simple operation, while a smart memory features automatically remembers your most recent brightness setting. In a matte black finish. Height adjusts from 44" to 54" high. 71" high with head stretched up to full vertical position. Base is 8" wide and 10 1/2" deep. Built-in LEDs. Light output up to 700 lumens (comparable to 60 watt incandescent). 5000K color temp. Electronic touch dimmer button on column. Smart memory feature remembers last brightness level. Matte black finish. Metal, resin, and rubber construction. 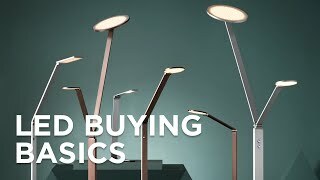 I was looking for a simple, modern, cleanly designed floor standing reading light with a flexible lamp, one that I can move around and would cluttering the room. I also wanted a store that specialized in lighting, that didn't sell everything from pampers to sneakers. I felt that you would stock quality products. 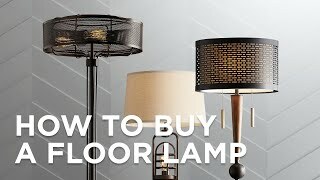 Girlfriend wanted a floor lamp for her birthday. Think this will be perfect fit. It will fit in a narrow space and offers touch dimming! Looking for a reading lamp in my bedroom. This does not take up nightstand space, has the touch on/off and dimmer feature, appears to adjust easily and is compact and modern looking. We like LED lighting; have experience with Ott-Lite brand (fluorescent). As a lamp for my mother to light up her work space while doing puzzles on a dining room table. looks like it wont take up much space , & be bright for hand work. Simple & w match my blk iron table lamps. It’s perfect for our space and the reviews were helpful! Needed slim, not too tall, adjustable reading light. We ordered this same lamp a few weeks ago, and liked it so much that we ordered another. I chose this lamp especially for reading. So I wanted a design that concentrated the light in one direction. For reading without lighting up the whole room. BEST ANSWER: No, you have to plug it in. I love this light, it's excellent to use. Does great when I put my makeup on, makes it so easy.....and it has a button where you can brighten it or lower the light amount. No, it is plug in. 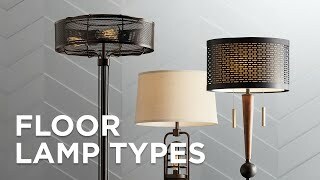 What would be a good floor reading lamp to use with a recliner? BEST ANSWER: This would be a great option as a reading floor lamp next to your recliner. We have two of these lamps and both of us are happy with them. They make excellent reading lamps. I also use mine for doing my cross word puzzles. This lamp is perfect !!! Ott-lite felix--we have had ours for a least a couple of years adjusts to any level or angle! 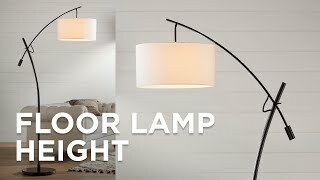 Can this lamp be used with a remote controlled outlet with dimming capabilities? BEST ANSWER: Hi - No, this is only designed to be dimmed with the included electronic touch dimmer. Is the Light or l.e.d's replaceable? BEST ANSWER: Hi - the LEDs are built-in (integrated) and non-replaceable at this time. But, they have an approximate life expectancy of 40,000 hours. 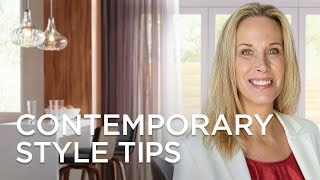 The video guide for choosing lamp height says the bottom of the shade should be at or below eye level. Seated in my chair, my eye level is at approx. 36”. However, the shortest height to which this lamp can be adjusted is 44” Can the light of the lamp be adjusted downward in such a way that a short person (me) might be able to use it for task lighting without getting glare in eyes? BEST ANSWER: Hi, to avoid any glare you can adjust the light's head accordingly. The only helpful information I can give you is that the light - or the "head" - adjusts in multiple directions by twisting it. how much assembly is required and the difficulty? BEST ANSWER: It is very easy to assemble. I have emailed you a copy of the assembly instructions. Very little and very easy. BEST ANSWER: Hi - this has an approximate net weight of 8 pounds. It weighs about 7 pounds. It's a very good reading lamp. how does 700 lumens compare with output of 60w incandescent? Where is the cord coming out? BEST ANSWER: There is a thick ring at the bottom of the neck just above the disc the light sits on. The cord comes out of the back of that ring. the cord comes out where the pole is attached to the base--base is very steady as there is no cord under it!! excellent lamp!! The cord plugs into the lamp pole just above the base. BEST ANSWER: It is about 12 inches below the gooseneck, and you will see a white circle, Just press the circle and the light comes on --I guess the circle represents an electronic button. Just below the bend you will see a white circle on the black pole. Slide your finger lightly over the circle and it will turn on or off. The on / off switch is build into the pole. This allows you dim the bulb also. It is bright enough for reading and puzzle solving. A good buy for the money. Excellent lamp, good looking, amazing price. Would be 5 stars except gooseneck is a little weak, tends to flop unless positioned about like the picture. I wanted the lamp part to be horizontal to the floor. Delighted with the lamp. Bought two. Very happy with these lamps. Great for reading. Doesn't cause glare in the TV either. Good light hue for reading. Very stylish and the touch on-off button is pretty cool. Use it for adjusting intensity as well. Gives lots of light. Flexible and fits in to small space. Lamp is fine, but service and help from your staff was even better. I am using this lamp at my sewing machine. I love the clear light and the ease for turning it on and off with a finger swipe. I do recommend it for anyone doing up close work. This floor lamp is exactly what I was looking for. The features are great and the light is perfect by the computer desk because you can tone it down if you want. I like the touch on/off button...so convenient! I would recommend this product for sure! I am very pleased with my lamp. Easy to install and very bright ! This light makes it so easy to use when I put on my makeup. You can lower the light amount or brighten it more with just a push of a button. It bends to how you want it. Better than I expected. It is pretty maneuverable, good reading lamp, the on-off/dim button is amazing. Perfect for sitting chair and reading at night. This light gives the best light. I love that I can dim it. Perfect! Does just what I need. I bought this lamp to add more light to the room and specifically for reading. It does just what I need although I wish it were a little taller. Good light but the switch doesn’t work to turn it off. Hi Cheryl B., sorry to hear that the switch on your lamp is not working properly. Our customer service team has reached out to troubleshoot the issue with you. Please let them know of any questions or concerns. Thank you. A petite lamp head makes this adjustable LED floor lamp an ideal choice for compact spaces.